We love seafood here in our home and prepare seafood about twice a week for dinner. In addition, we have a family tradition of always having a variety of seafood on New Year's Eve. This past New Year's Eve my hubby made us some delicious Baked Stuffed Lobster to enjoy! Kill the lobster by inserting a sharp knife in it's back between the body and tail shells. Split the lobster open lengthwise, remove the stomach and intestines. Crack the large claws and lay the lobster flat on the counter. Coat the bread crumbs in the melted butter, salt and ground black pepper, then place into a baking dish. Toast the bread crumbs in the oven at 350 degrees F. for about 4 minutes. Remove. Use a spoon and fill the cavities in the lobster with the toasted bread crumb mixture. If needed, drizzle a little more butter over the outside of the lobster. 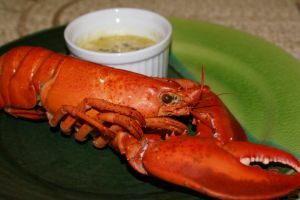 Place lobster in a baking dish and bake in a hot preheated oven set at 350 degrees F for 20 to 25 minutes, or until lobster meat is done. Remove and serve immediately.